Home Uncategorized Russell Wrestles the Relatives + interview w/Cindy Chambers Johnson & giveaway! A few years back, I was given the happy opportunity to mentor Cindy Chambers Johnson through SCBWI-IA’s mentorship program. She was hugely talented, but she was also witty and charming and soon felt like a friend. 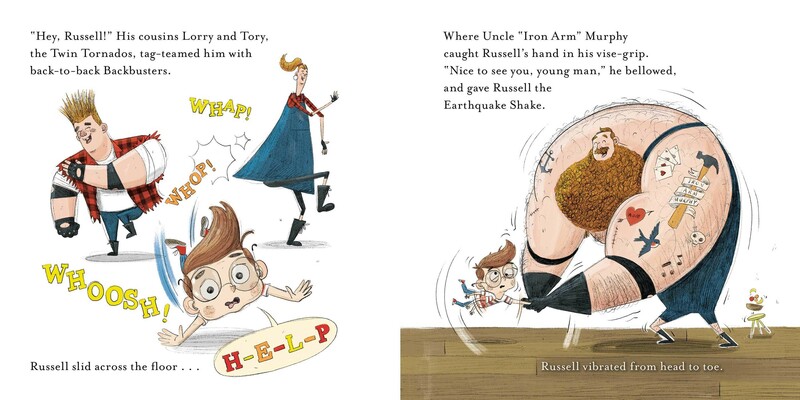 So I couldn’t be more excited about her debut picture book, RUSSELL WRESTLES THE RELATIVES. In the story, Russell is dreading his family’s impending reunion, because his relatives are professional wrestlers, every last one of ‘em. And they’re a little more offbeat, a little more everything, than your typical family. Russell is pummeled and pounded and slammed about as his boisterous relatives greet him with their own brands of hugs and back slaps and squeezes. Eventually, he discovers his own unique moves and evasive actions and is able to save his bacon. This story absolutely overflows with humor and heart … my favorite combination. And British illustrator Daniel Duncan’s art perfectly reflects the wacky, exuberant story on every spread. See? But what strikes me as this story’s standout element is the spectacular language. I’m a sucker for a book with language that’s Crafted. And on these pages, words sparkle and pop and pull giggles out of you faster than The Slippery Sidewinder. I had a few questions for Cindy, who was kind enough to agree to an interview. 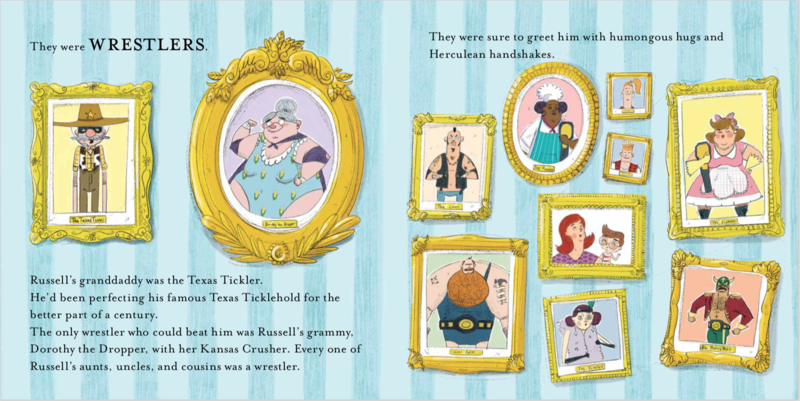 JE: Kids are going to love this story’s playful language, and adults will love wrapping their tongues around kooky wrestling moves like the Texas Ticklehold, the Knuckle Knocker, and the Kansas Crusher. Must have been a blast to brainstorm those and the stage names of each relative…? CCJ: Thanks, Jill! I hope kids and their families will have fun with it! I had a lot of fun coming up with the names of the different moves and characters. Some of them, like the Texas Ticklehold, the Kansas Crusher, the Washing Machine and the Spin Cycle came from “moves” that my husband and his father would put on my kids. The toughest one to come up with was the Smackdown Smooch, which my critique group finally named with after a lot of brainstorming. I tried to imagine normal ways that relatives greet the children in the family then exaggerated them into a wrestling move. JE: Oh, I love that your family KNOWS these moves! And I can just imagine the laughs in those brainstorming sessions. There isn’t a word wasted in this story, Cindy. So tell us about your writing process and the story’s journey to publication. Quick and smooth, or slow and rocky? CCJ: Definitely slow and rocky. This story went through more than 50 revisions before it got to the state that it is in the book. After I had written and revised it a few times, I showed it to my critique group, who had suggestions for more revisions. Once I thought it was ready to submit, I sent it to three agents and one ask for an exclusive, and another revision. She then signed me, asked for more revisions and finally sent it off to several editors. Each time an editor replied, we took another look and often revised again based on comments that made sense. 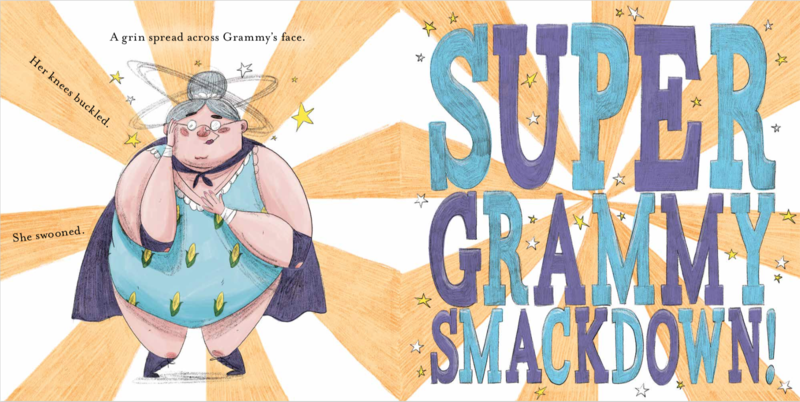 Originally, the manuscript was titled SUPER GRAMMY SMACKDOWN. One of my critique partners suggested changing it, as it gave away the ending, but I resisted. Once it was being shopped around by my agent, I noticed that many editors showed interest, but made comments that it wasn’t as boisterous as they hoped. When one editor said it wasn’t for her and compared it to THE HUNGER GAMES, I finally realized that the title was setting up expectations that weren’t fulfilled by the text. Once I changed the title, it sold fairly quickly. Just goes to show that I should always listen to my critique group! JE: True! In one of my favorite parts of the story, Russell the not-wrestler discovers his own specialty moves in a clever and natural way that I didn’t see coming at all! Was that turnabout planned from the beginning or did you come up with it in a later draft? CCJ: My first drafts were pretty much lists of wrestling “moves” that Russell used to escape his relatives’ clutches. Draft by draft, I worked on slowing Russell’s progress and letting him fail more before finally finding his own way. I hate making my characters suffer, but it only makes the success at the end sweeter when I do. JE: That’s so true. How did the art go above and beyond your expectations? CCJ: Oh my goodness – only in every way. Aren’t Daniel Duncan’s illustrations wonderful? I knew that I couldn’t expect to have any input in the art decisions and was prepared for something I might not like all that much. Karen Nagel, my editor at Aladdin, surprised me by sending a sketch and asking what I thought. It was the scene where Russell meets Uncle Iron Arm Murphy and I was instantly in love with scrawny Russell and with Iron Arm, with his huge muscles and tattoos. In my mind, I had imagined a more 1950’s style wrestler, but this was so much better! I didn’t find out who the artist was for quite a while, as they hadn’t signed him yet. I don’t know what they would have done if I hadn’t liked the sketch, but so pleased it didn’t come to that. Another nice surprise was that Daniel put all of the family pictures in the illustrations. That is something that I had imagined beginning with my early drafts, but hadn’t ever included in any notes or mentioned, so it was a thrill to see my vision and Daniel’s match. Daniel and the art director, Laura DiSiena both did an amazing job. Bio: Cindy Chambers Johnson grew up in Hutchinson, Kansas, where she received her fair share of Kansas Crusher hugs and visits from far-flung relatives. (None of whom wrestled for a living – thank goodness.) 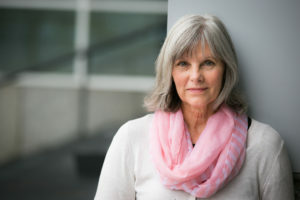 Cindy’s interest in family ties and inherited traits led her to a career as a genetic counselor, but a love of reading and writing passed down from her mother led to her career as an author. 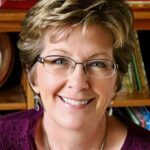 Cindy now lives with her husband and two children in Des Moines, Iowa and only administers the Texas Tickle Hold when absolutely necessary. 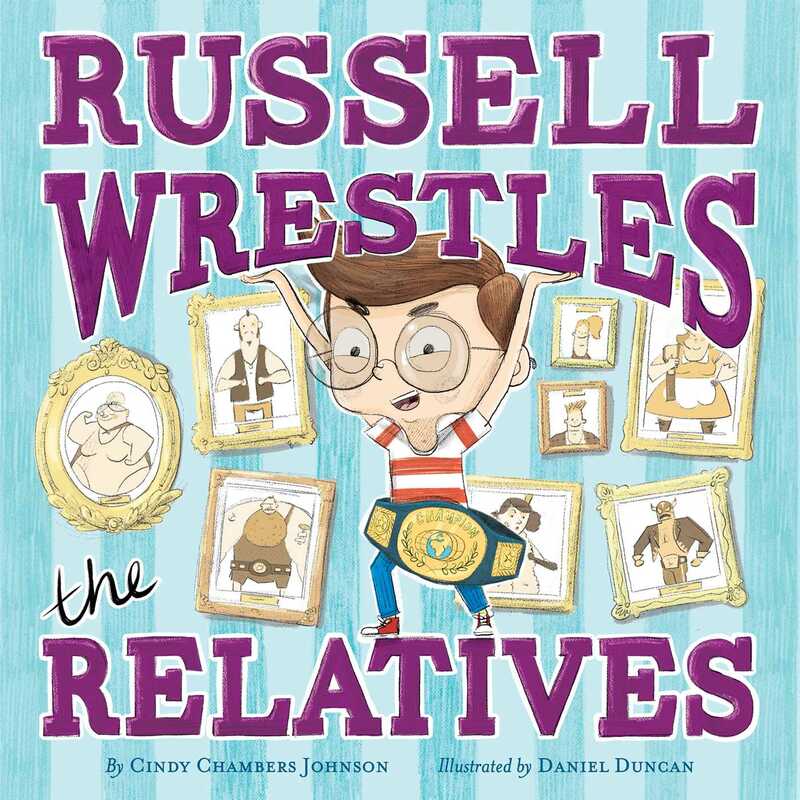 If you’d like your very own copy of Cindy Chambers Johnson’s debut picture book, RUSSELL WRESTLES THE RELATIVES, just leave a comment below to enter. I’ll randomly select a winner and announce the winner in my next post later this month. Good luck! Carrie Pearson won a copy of Maria Gianferrari’s beautiful HAWK RISING in my last giveaway. Thanks for entering, Carrie! Aladdin, book giveaway, Cindy Chambers Johnson, Daniel Duncan, giveaway, humorous picture book, Jill Esbaum, Russell Wrestles the Relatives. Bookmark. Lovely interview, Jill & Cindy. Can’t wait to get my “Picture Book Pusher Paws” on Russell! Congratulations! Thanks so much for sharing your journey with this book! I am excited to get my hands on it, it looks hilarious and the illustrations are incredible. Congrats! This book sounds hilarious! Congratulations on your debut, Cindy! Thanks for the fabulous interview. And congrats Cindy! The pages shown are so fun and creative! Thanks, Mary. Daniel did such a wonderful job! I have to read this book. The clever language and unique concept have me hooked. Congratulations, Cindy! Delightful interview. It is comforting to hear about the process other writers use when creating their manuscripts. It give me hope. It can be a long discouraging process, DaNeil. Hang in there and don’t give up! Wow, such a clever and fresh idea – love the language and illustrations! It’s also a good reminder that a successful story takes a long time, hard work, and a great critique group! Yes! It takes a village to make a picture book! Sounds like a real fun tumble of a book. Congratulations, Cindy! Sounds like such a fun book! I can’t wait to check it out!!!!! Thanks, Debra! I hope you enjoy it! OMG what fun! I can’t wait to wrestle this book away from the bookstore. Best of luck to you! This book looks hilarious and fun! I can’t wait to read it! Thank you! It all started when my son knocked me over trying to give me a kiss! This book is based on an idea I wish I’d had. The illustrations and text are well done. I can’t wait to read this for myself. I love your creativity!! The book looks hilarious! I’ll be adding it to my collection! This looks like a lot of fun! Congratulations on your debut! I absolutely love this book! Thanks for the interview!! Very interesting about the book title setting the expectations for the text and, in this case, not meeting them with the original title. Very good lesson. Yes – I’d always heard that the title didn’t matter, but I’ve changed my mind! Sounds like the word play in this book is amazing. Can’t wait to read it. Looks like a fun & clever read–thanks for sharing, Jill & congrats, Cindy! Thanks, Jill, for sharing Cindy’s fabulously funny book about relatives! Who hasn’t experienced kisses that leave a big red cheek smudge or someone with really bad breath?! And don’t forget the prickly mustache kiss – from your great aunt! Thanks, Mary! I am always on the lookout for new books with spectacular language to help my first graders expand their vocabulary. Russel Wrestles the Relatives should also particularly grab the attention of my students who are fans of wrestling. Thank you for helping me to know about this book! So different and fun. A fantastic idea. I can’t wait to see this one. Congratulations on a fun book. Can’t wait to see it now after your interview. Love hearing the story behind the story. Wonderful interview! Congratulations Cindy! Russel Rocks! Wow! What an interesting family! Just love this! Can’t wait to read it! Congratulations, Cindy! This looks like so much fun! What a fun idea!!! Can’t wait to read it! This looks so fun! I love the nicknames. Thanks for the interview, Jill, and congratulations, Cindy!! What a fun look at a crazy family! I think kids will really enjoy this story! Persistence and Patience pays! Good for you. The language and illustrations…oh so wonderful! Congratulations, Cindy! Can’t wait to read your debut book! Such a great concept! I can’t wait to read the whole book! Fun, fun, fun! Congratulations! Perfect timing with reunion season upon us! This look so fun to read and must have been fun to brain storm the names. Its so true about family reunions with each member having a unique hug, greeting or grunt. I’ll be reading your delightful book to my grandson. I’ll enjoy it all over again reading it to him! This looks like such a fun story! Clever and creative and those illustrations are wonderful. Congratulations to both Cindy and Daniel!! What a fun and clever concept! Can’t wait to read it. This sounds like my kind of book. I can’t wait to get my mitts on it! Congrats, Cindy! This book looks like a hoot!! Thanks Cindy and Jill for all of the good information. It makes me feel so much better to know that other people’s stories go through 50 drafts. Thank you, Cindy! Such a fun book and interview. I really enjoyed this post and can’t wait to pick up a copy. Thanks for sharing the journey! Sounds like a super fun book, Cindy. congratulations. I am so thrilled I got to meet Cindy in July in Iowa! She & I are in the Epic 18 Debut picture book group. This is such a fun story. I enjoyed the interview!